September 2015 – This is a blog. I write it. Hibiscus tea is made from the dried flowers of the hibiscus tree and is a popular drink in Egypt as well as in other countries. While you can drink hibiscus tea hot, my preference is for it to be chilled. So if you have hibiscus tea bags, cut the tea bag and drop the leaves/powder into the water, add sugar and boil it. If you have very few tea bags add very little water – preferably only a little more than a teacup. The tea needs to be strong for the flavour to emerge. Once it has boiled, put it aside to cool. After it reaches room temperature, transfer it into another vessel, post straining it. Then keep it in the refrigerator to chill. Once it has chilled sufficiently, pour it out into glasses and serve it. Hibiscus tea looks like sherbet but has a very kokum-like flavour. And much like kokum juice, it is cooling and refreshing. 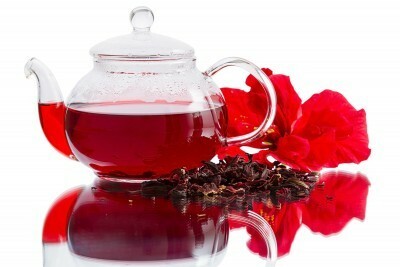 For those who feel tea is boring, hibiscus tea is the one to change your perception. It can pass of for a party drink instead of the usual carton juice. But, keep in mind you ask for it to be chilled because when hot the flavour is… diluted. He looked at her with longing. Then remembered that he had agreed to take the injection.